The NEIYA has an elite, eclectic duo headed to the Great Western Challenge at this very moment. Two islanders as it happens. First is Chris Gordon (the man from Nantucket) and Chad Atkins (the man from Conanicut Island, or the Planet Zork, depending on who you ask). They are approaching Chicago, burning up the highway and no doubt having lively discussions on the economy, philosophy, politics, and the books they’ve read recently. We wish them well out there- sail fast, travel safe and send updates boys! There is also a contingent from Deep Creek MD on the way, all the best to them as well. 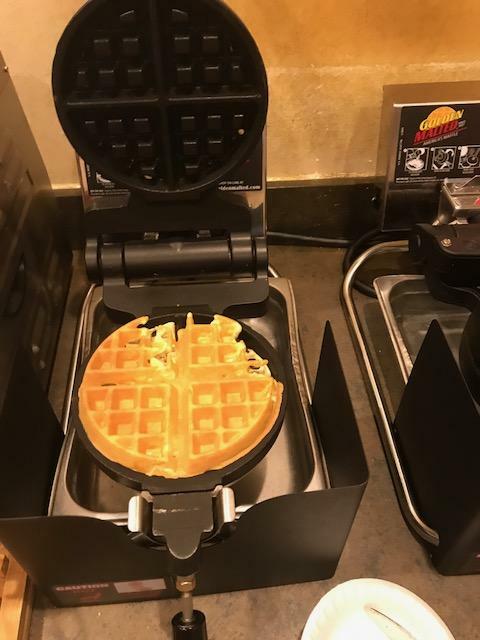 Enjoy the trip and have a hotel breakfast room waffle for all of us stuck back here at work! This entry was posted on 11/30/2017 by Commodore James "T" Thieler DN US 5224. It was filed under 2017 Season . I love those waffles! Just add a bit more batter.